Discover one of L.A.'s greatest cultural attractions. The Griffith Observatory's grounds, exhibits, and telescopes are open and free to the public each day the building is open. The observatory also offers programs, special events, and public “star parties.” The DASH Observatory Bus offers convenient access to the Observatory seven days a week. The story of the Griffith Observatory begins with Colonel Griffith J. Griffith, who donated 3,015 acres of land surrounding the observatory to the City of Los Angeles in December 1896. In his will, Griffith donated funds to build an observatory, exhibit hall, and planetarium on the donated land. His goal was to make astronomy accessible to the public. 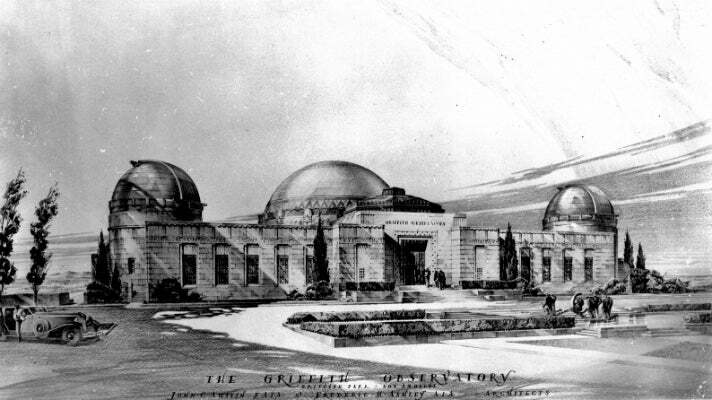 Some of the leading astronomers and scientists of the day were selected as the core team to plan the construction of the Griffith Observatory. 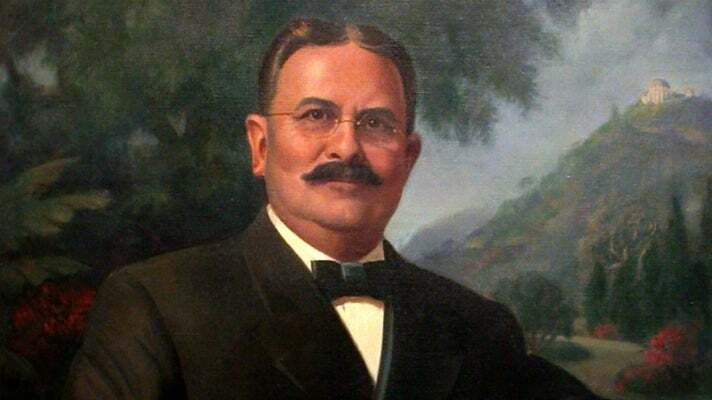 George Ellery Hale, who had overseen the creation of telescopes at Yerkes, Mount Wilson, and Palomar Observatories, steered the overall design. Caltech physicist Edward Kurth drew up the preliminary plans and later guided the construction of the building. Architects John C. Austin and Frederick M. Ashley were selected to oversee the final plans for the new observatory building. Austin and Ashley hired Kurth to direct the project with Russell W. Porter, the "Patron Saint" of the amateur telescope-making movement, as consultant. 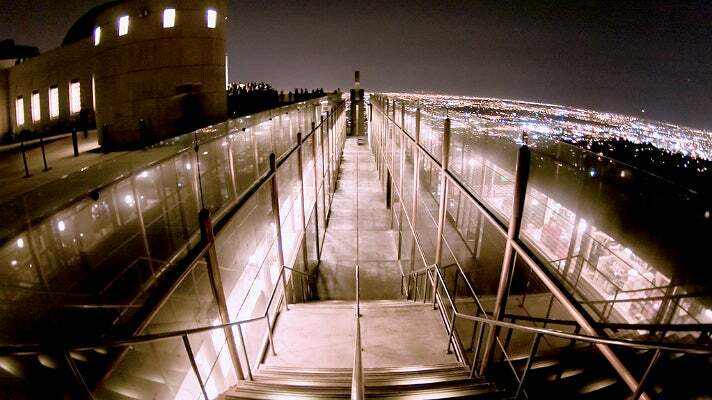 In 2002, the observatory closed for a $93 million renovation and a major expansion of exhibit space. It reopened to the public in November 2006. 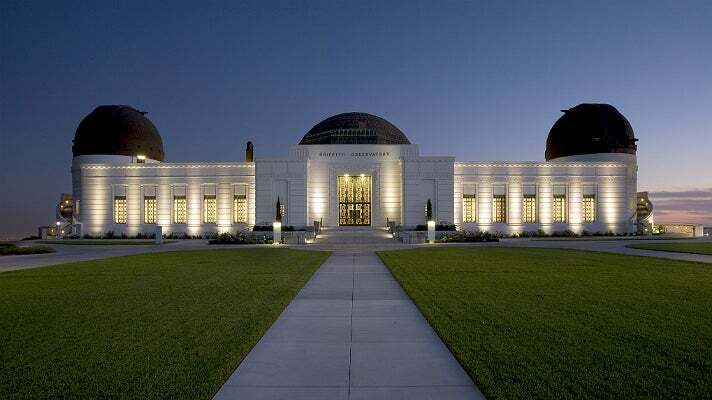 The existing Art Deco style building was restored and the aging planetarium dome was replaced. The building was expanded underground, with a lower level that features completely new exhibits, a café, gift shop, and the new Leonard Nimoy Event Horizon Theatre. The Café at the End of the Universe, an homage to Douglas Adams’ Restaurant at the End of the Universe, is one of many cafés run by celebrity chef Wolfgang Puck. 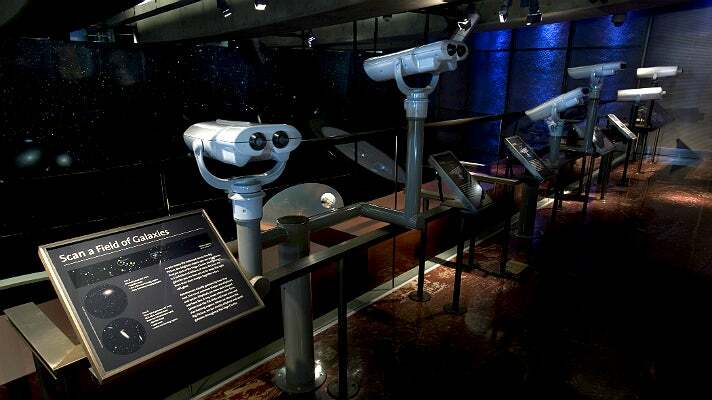 Each of the Griffith Observatory's major exhibit areas focuses on a unique aspect of observation. They include: Wilder Hall of the Eye, Ahmanson Hall of the Sky, W.M. Keck Foundation Central Rotunda, Cosmic Connection, Gunther Depths of Space, Edge of Space Mezzanine, and Exterior Exhibits. 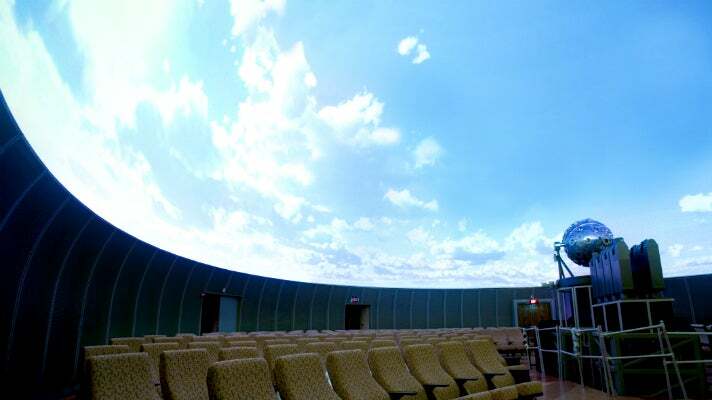 The Samuel Oschin Planetarium features an array of cutting edge technologies that present world-class scientific educational programming for audiences of all ages. At 75 feet, the seamless, perforated aluminum dome is one of the largest planetarium domes in the world. 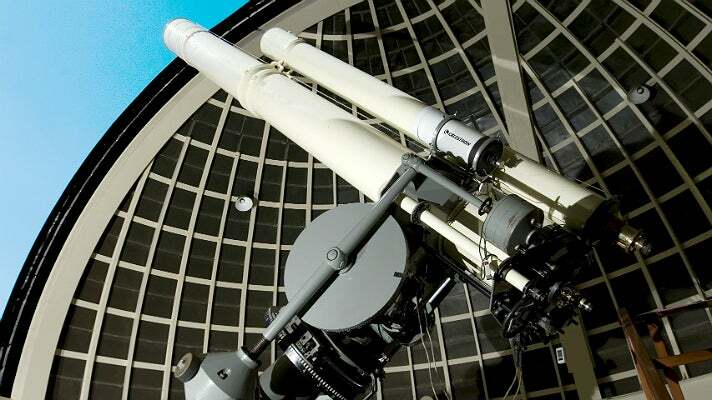 As part of the observatory’s renovation, the planetarium’s vintage 1964 Zeiss Mark IV star projector was replaced with a state-of-the-art Zeiss Mark IX Universarium. The theatre’s infamous wooden headrests were replaced by custom-designed, reclining seats. 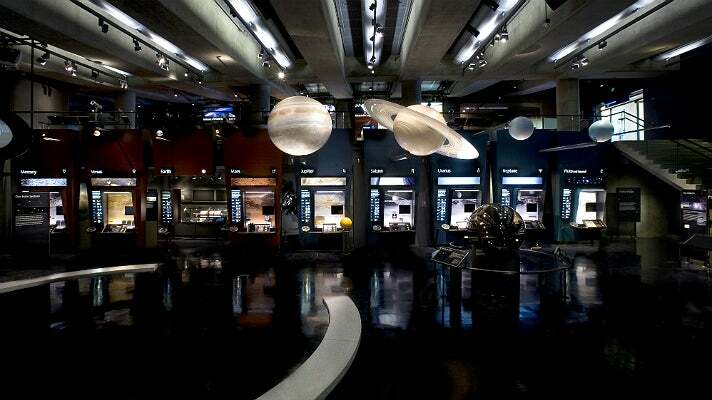 Visitors to the 300-seat planetarium can enjoy an experience that’s light years ahead of most planetarium shows. From the moment they pass through the historic bronze and leather doors, they are immersed in an environment carefully designed to create an authentic night sky and present high quality experiences that are not only awe-inspiring but thought provoking as well. For more info about current shows, showtimes and ticket prices, visit griffithobservatory.org/psoplanet.html. 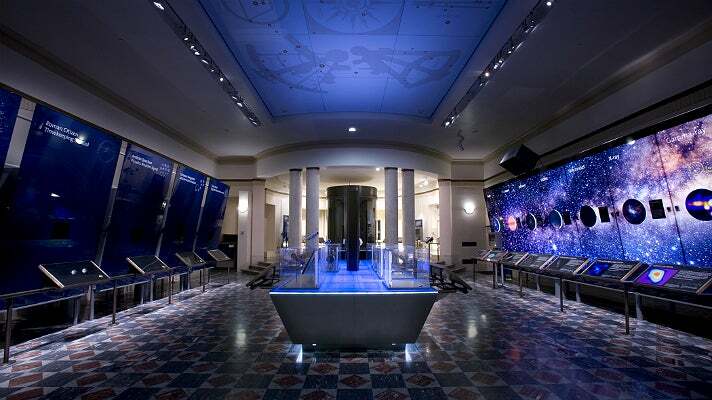 Located on the observatory’s main level, the Hall of the Eye illustrates the nature and progress of human observation of the sky and the tools used for that exploration. One of the hall’s highlights is a Tesla coil, built in 1910 by Earle Ovington and donated to the Griffith Observatory a year after his death in 1936. The machine was repaired with the help of Kenneth Strickfaden, who designed electrical special effects for Frankenstein (1931) and The Wizard of Oz (1939) among many other movies. 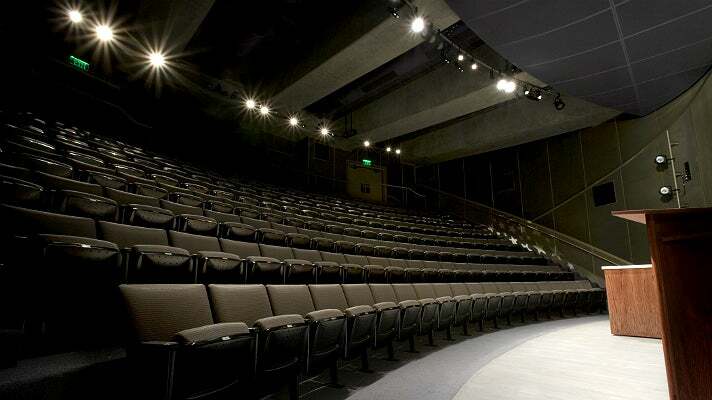 The Leonard Nimoy Event Horizon is a 200-seat multi-media theatre that provides a modern venue for lectures, demonstrations, films, museum guide talks, and a variety of other activities. The Leonard Nimoy Event Horizon is also an important venue for the observatory's school programs. The theatre uses a stadium-style seating configuration, which enables each audience member to feel close to the presenter. The Big Picture is one of the highlights of the Gunther Depths of Space exhibit hall, located on the lower level. The Big Picture is the largest astronomically accurate image ever constructed, measuring 152 feet long by 20 feet high. The highly detailed image depicts the core of the Virgo Cluster of galaxies and contains nearly a million faint galaxies, about half a million stars in our own galaxy (the Milky Way), a thousand distant quasars, a thousand asteroids in our own Solar System, and at least one comet. Visitors can explore The Big Picture from within arm's reach or through telescopes placed 60 feet away. Visitors don't even need to enter the Griffith Observatory to become observers. The exterior of the building offers a mix of exhibits and features that draw the eye and fuel the imagination, including the Solar System Lawn Model, Sunset and Moonset Radial Lines, and a rooftop observation deck. 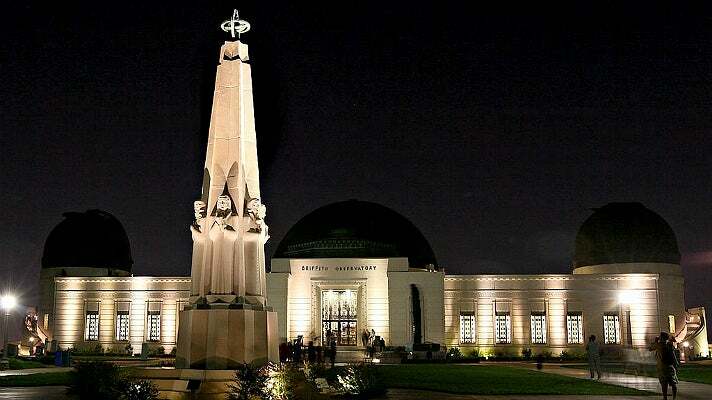 When visitors arrive at the Griffith Observatory, they are greeted by the Astronomers Monument, a concrete outdoor sculpture on the front lawn that pays tribute to six of the greatest astronomers of all time: Hipparchus, Copernicus, Galileo, Kepler, Newton, and Herschel. The Robert J. and Suzanne Gottlieb Transit Corridor is a monumental 150-foot-long, 10-foot-wide glass-walled passageway that immerses visitors in the motions of the Sun, Moon, and stars across the sky and demonstrates how these motions are linked with time and the calendar. The Gottlieb Transit Corridor is an accurate outdoor public astronomical instrument that’s built below-grade onto the west side of the observatory. Its form is similar to instruments from ancient temples and medieval churches, but updated for the 21st century. Like the observatory's other public observing instruments, the Gottlieb Transit Corridor transforms visitors into astronomical observers and immerses them in the meaning of those observations. The Griffith Observatory has appeared in numerous TV shows and films, including two major sequences of Rebel Without a Cause (1955), starring James Dean and Natalie Wood. 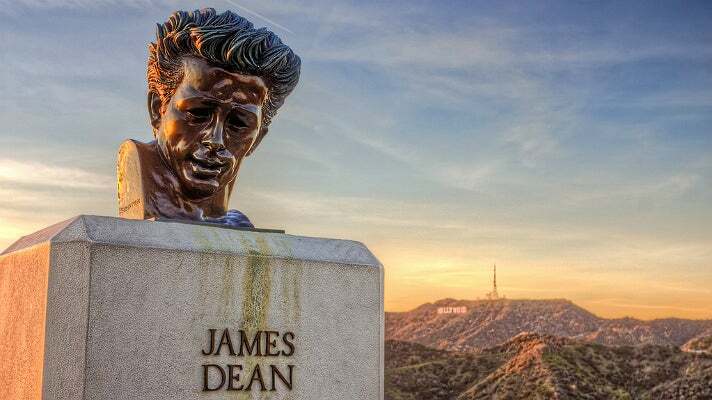 A bust of James Dean is located at the west side of the observatory grounds. Other observatory film appearances include La La Land (2016), The Terminator (1984), The Rocketeer (1991), The People vs. Larry Flynt (1996), and Transformers (2007).